The N.C. A&T Office of Research Compliance and Ethics has released a new edition of “Biological and Biohazardous Materials Safety Guide For Researchers,” the university’s comprehensive guide to biosafety. The guide is available on the university website. It covers roles and responsibilities; biosafety requirements; biosafety levels; accidents, exposures,and spill response; and biohazardous waste pick-up. Biosafety on campus is a joint responsibility of the university’s Biosafety Officer, Dr. Tonya Hargett, and the Office of Environmental Health and Safety, headed by Ms. Louisa Thomas. The Fall 2011 Guide to the Division of Research and Economic Development (.doc) is now available. It contains contact information for DORED staff members and brief guides on various aspects of proposal development and submission, research compliance, and technology transfer. It’s not a comprehensive guide to everything related to research and economic development, but it should help answer a lot of questions and tell you where to go for more information. CHESS codes and DUNS numbers. AWR and USPTO. Whether you’re dealing with an IDIQ, an NCE or even a plain old RFP, these are terms and acronyms just about every PI and GA will run into sooner or later (and that goes for all you VC’s, too). If you ever finding yourself struggling to make sense of grants, proposal writing and the Division of Research and Economic Development in general, the DORED Glossary and Guide to Acronyms (.doc) may be just what you’re looking for. And if you think of a term or acronym that should be in there but isn’t, let us know! Use the blog’s comment function or email drarneke@ncat.edu. A major new training initiative is under way for researchers funded by NIH and NSF. Training is also coming on the new electronic application for using animals in research. An Undergraduate Research Symposium is scheduled for September 21-22. Oh … and the Office of Sponsored Programs would like to have a word with you about deadlines for research proposals. Faculty members and grad students will be receiving information on all of these of these subjects in the first monthly edition of the Research A&T newsletter for the 2010-11 academic year. It will be arriving via campus mail as early as today. If you can’t wait to see it, here’s a PDF version. 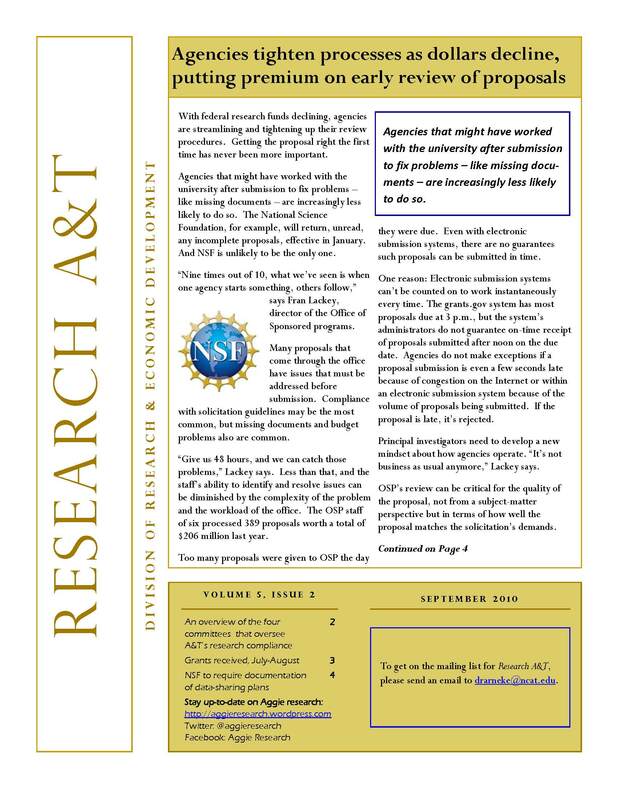 This two-page guide to the Division of Research & Economic Development contains key phone numbers, the fall research training schedule, and lists of A&T research clusters and centers. And details on where you can find Aggie Research on Twitter and Facebook.